Her voice a force of nature and her theatrical sense undimmed, Odetta-made music of extraordinary compassion, intuition and grace. Once, ahead of a concert in Bridgeport, Connecticut, I asked Odetta about music heard in her house growing up. Her response was immediate and–to me–surprising: The Grand Ole Opry. She went on to recall her father, who died when she was a child, sitting in his easy chair listening every week to that country music jamboree, beamed over clear-channel AM radio into her family’s Birmingham home. Her point in telling that story was, I think, to defy expectation. Defying expectation was something Odetta did in music–where her sensational voice could be a pure narrow flute in one phrase and a growly shout the next–and in life. At the age of 6, she left Alabama with her mother on a segregated train and settled in Los Angeles. Odetta’s mother expected her to sing in church. A voice teacher in Los Angeles trained her in opera and lieder and expected her to be the next Marian Anderson, whose groundbreaking 1939 concert at the Lincoln Memorial, heard live on radio by millions, had defied Washington’s race codes and made a classical music career seem possible for an African-America artist. But Odetta loved theater and wanted to be a bohemian. Barely out of her teens in the early ’50s, she was singing in San Francisco in a touring production of Finian’s Rainbow and picked up a guitar to fit in with after-hours scene. Soon she was listening to field recordings from Louisiana prisons, to the seminal Anthology of American Folk Music, to everything she could get her hands on. Pete Seeger heard her in a living room–“this quiet little girl,” he’s said, singing Leadbelly’s songs; he told her he wished the twelve-string guitar giant was still alive to hear it. 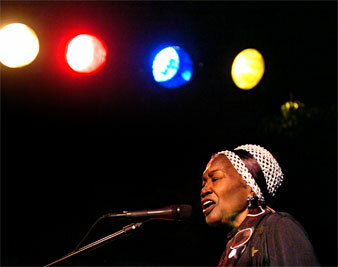 Within a few years her titanic contralto was one of the defining sounds of the emerging folk music revival and the sound of the early civil rights movement, culminating in Odetta’s 1963 appearance at the March on Washington–singing at the Lincoln Memorial, in Marian Anderson’s footsteps after all. Up through her final appearances in recent years–her voice in her 70s still a force of nature and her theatrical sense undimmed, despite arriving on stage in a wheelchair–she would take familiar songs and turn them inside out; or intuitively, in the middle of a concert, merge one old tune into another, to the illumination of both.